Two employees of the Office of the Dean for Undergraduate Education and Student Affairs have filed harassment charges against the Institute with the Massachusetts Commission Against Discrimination, according to MCAD spokeswoman Jane Brayton. Sharon P. Shea filed a complaint on Nov. 2 and James R. Tewhey filed charges on Aug. 17, according to MCAD spokeswoman Jane Brayton. Tewhey, a former associate dean for residence and campus activities, was removed as dean in April after he exchanged harassment charges with Katherine M. Nolan, a financial aid administrator with whom he had an 18-month long affair. Tewhey and Nolan filed sexual harassment charges against each other within MIT, and Nolan received a six-month restraining order by a Newton court barring Tewhey from contact with Nolan and her daughter. 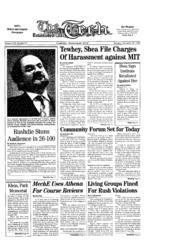 Later, both Tewhey and J. Paul Kirby '92, who had worked with Tewhey as Undergraduate Association vice president, filed MIT harasssment complaints against Shea for spreading rumours about them. In Tewhey's MCAD complaint, he alleged that MIT investigated Nolan's complaints against him, but would not investigate his complaints against Nolan and Shea. "You cannot allow or should not allow a person's reputation and career to be destroyed on the basis of unsubstantiated allegations. MIT cannot as an institution refuse to investigate the types of charges that were made against me last spring," Tewhey said. In her MCAD complaint, Shea alleged that she was denied a promotion and had her workload reduced because of Kirby's complaint, and because she had filed a sexual harassment complaint against Tewhey in June 1992. The MCAD is investigating both complaints, but has not decided if sufficient facts exists to pursue the charges, Brayton said. If the agency accepts the charges, the investigations could take as long as two years, she said. Institute officials have declined to comment on any personnel matters or specific allegations, but The Tech has received several letters written by Provost Mark S. Wrighton, Personnel Director Joan F. Rice, and Tewhey that describe some of the events. Several of the letters contradict earlier statements by Wrighton that Tewhey resigned on April 21. Tewhey denies that he resigned. Tewhey said he was terminated the week of Oct. 15. Tewhey claims that a double standard seems to exist for harassment involving men and women. "There were a set of actions that ... that had I engaged in would be defined as sexual harassment, and conversely absolutely nothing was done when these activites were being done to me," he said. Tewhey claims that Nolan talked to several administrators at the Institute and tried to have him fired after they ended their affair. In a letter dated June 4, Rice told Tewhey that his complaint against Nolan would not be investigated. "I do not believe that the policy was intended to apply to a dispute between two MIT employees where, as here, the interests represented by the policy are only peripherally implicated," she wrote. Tewhey's complaint against Shea was not investigated either. In a letter dated Aug. 4, Wrighton wrote, "It is not clear to me at this point how much of what you describe in your letter [about Shea] would be appropriate for review under MIT's grievance policy." Tewhey maintains that a full investigation of his charges and the charges against him could clear his name. "My position all along has been that any investigation would exonerate me. I personally believe not to do it is a serious mistake for everyone involved," Tewhey said. Tewhey stepped down as associate dean after he was placed under a restraining order by a Newton District Court judge on April 16. Tewhey charges that Nolan attempted to convince his supervisor and other adminstrators the he should be fired, and also harassed him directly. "She has made numerous false charges, has followed me around the campus, [and] initiated verbal confrontations," he wrote in a letter to Rice. In the letter, he also charged that Nolan used her position at MIT to "attempt to access my employment records and academic records at other institutions." In her affidavit in Newton court, Nolan charged that Tewhey harassed her 25 times. Describing specific incidents, she said that Tewhey approached her in a parking lot after work and that he followed her in his car on one occasion. Tewhey also said he has been harassed after he was removed as dean, but he does not know who is responsible for the harassment. Packets containing information which Tewhey described as inflammatory were mailed to his adviser and others at the Massachusetts College of Law, where he is now a student. Tewhey also said that an anonymous caller told the Massachusetts Department of Social Services that he had abused his daughter. "I think what has been stunning is the fact that incidents have continued to occur in which not only I have been attacked but members of my family have been attacked, long after I left," he said. In late April, Wrighton said that Tewhey submitted his resignation, but letters from Wrighton and Rice to Tewhey contradict that statement. According to the letters, Tewhey had not submitted a letter of resignation as late as Oct. 15. In his April 21 statement, Wrighton said, "Jim was in an untenable situation. He had been considering leaving since March and felt the time now had come to resign. I agreed with his assessment and accepted his resignation without any prejudgement on the harassment allegations involved in the court order." But in a letter dated Aug. 4, Wrighton wrote that "the primary effort should be made now to formally resolve your severance arrangements with MIT. Joan Rice, in her July 9 letter to you, invited you to finalize arrangements that I had proposed back in April." The severance agreement proposed by Wrighton included full salary and benefits for Tewhey through June 30, 1993, according to a letter from Rice to Tewhey dated Oct. 7. In that letter, Rice wrote: "If you are unable to confirm your resignation in writing, you leave MIT little option but to assume that you are rejecting the agreement and to discontinue providing salary, effective Oct. 15, 1993."